According to the company Social Life Management, half of the 75 percent of adults who Google themselves find negative results. Competitors, former business partners and disgruntled clients all have the potential to write harmful attacks on your character via the platform almost everyone can access — the Internet. So why should you care about your online reputation? Well, if you can find unfortunate details about your personal life, so can potential clients. You may be losing business due to negative remarks about you. And worst of all — they might be completely false claims. If you can find unfortunate details about your personal life, so can potential clients. Don’t change up your outreach approach or client-facing techniques if those aren’t the reasons for squandering prospects. Instead, use a personal reputation manager — like Reputation.com, ReputationManagement.com or Social Life Management — to find the issues hindering your success. What’s a personal reputation manager? 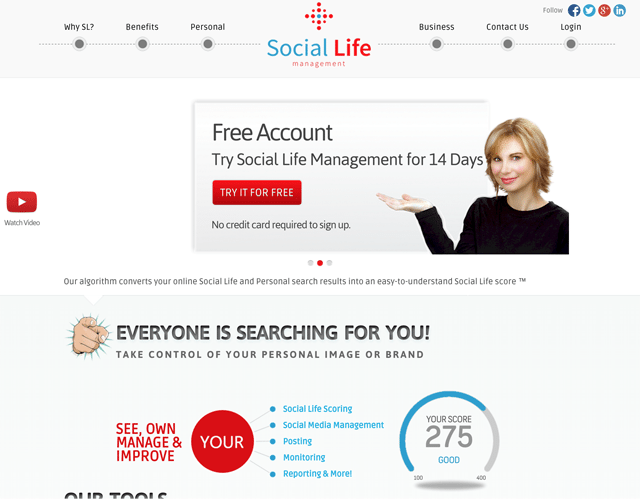 One example, Social Life Management, is a cloud-based platform that uses an algorithm to give you a “Social Life” score. This grading system is similar to any ranking that monitors your social influence, much like a Klout score. The more influential you are online, the higher your score. This platform also supplies users with tools to regulate and potentially fix their online reputations. Social media management, unique postings, monitoring and reporting are all available, depending on the package you purchase. In addition, the reputation manager provides press releases, fresh content and, most interestingly, link suppression. Link suppression moves negative results further down the page in Google. It doesn’t take an SEO expert to know that most people don’t bother going past the first few pages of search engine results. Pushing the negative content farther down the page limits the number of eyes on unsavory remarks. Busy clients might even stick to just the first page to see whether you’re a well-rounded, legitimate agent. Individual review sites may offer ways to increase your star rating, but that’s only for your agent persona. Potential customers don’t always discern between your public and private life, so monitoring both is key to building credibility. Most of these programs are relatively easy to use, but they may require more information depending on the level of management you desire. First, you have to identify which results from your name are actually related to you, which are unrelated and any negative press you want to avoid. What some might consider negative could be construed as positive — it all depends on how you see feedback affecting your business. Passive image maintenance tracks your name and mentions on social media. Passive image maintenance tracks your name on social media. Many companies also offer pay-per-action tools, which are much more intricate. The Social Life Management platform provides you with fresh content, DMCA (Digital Millennium Copyright Act) takedowns for copyrighted information and the ability to bury negative content, as mentioned above. It will also take your name off of public record sites, if requested. Why is it important in real estate? There are many reputation management services, but most are for larger companies that have a greater online presence. This service is targeted for individuals or independent contractors trying to build and maintain their personal brands. Even while working underneath a larger brokerage or within a team setting, it’s always important to focus on yourself as an individual, especially if you plan to branch out in the future. According to the California Association of Realtors’ homebuyer survey for 2015, over 30 percent of buyers Google their agent. Although this represents a decline from 2013, a third of buyers is too much business to risk. And, keeping a blemish-free online persona can only benefit you as you network with other real estate professionals or try out new career opportunities. At the very least, it’ll help you sleep better at night knowing your friends and family aren’t scanning potentially awkward stories from your past.